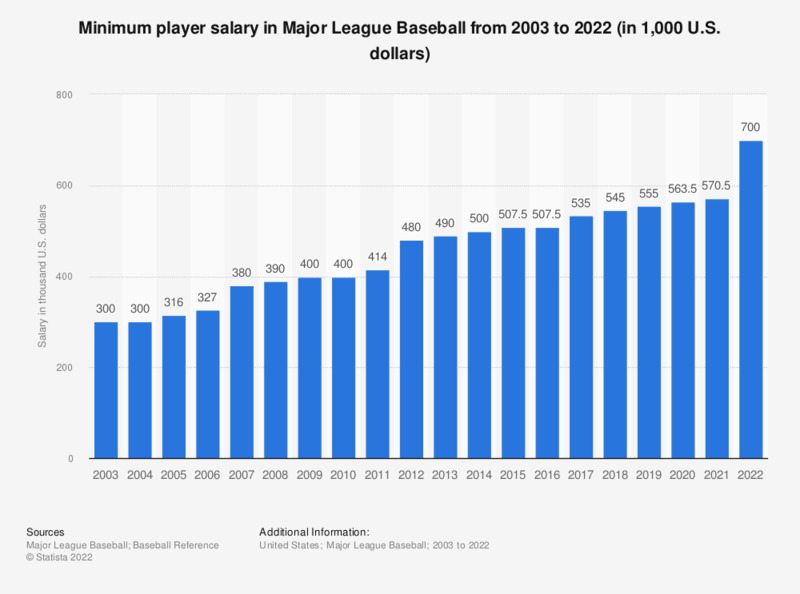 This statistic depicts the minimum player salary in Major League Baseball from 2003 to 2019. The 2017 MLB minimum player salary is set at 535 thousand U.S. dollars. Major League Baseball is a sport governing body in North America consisting of 30 teams that play in the American League and the National League. MLB not only determines rules and schedules of play, but also how its players, coaches and other staff are paid or taxed each season. MLB players are known to receive generous yearly salaries, in addition to performance incentives, such as prizes for games won. In 2017, the minimum salary for a MLB player was 535 thousand U.S. dollars per year. The average player salary in 2016 was however more than seven times higher than the minimum salary, at around 4.38 million U.S. dollars. Certain positions in the MLB, such as first base or starting pitcher, are usually better paid, due to the important roles they are considered to have in the game. The highest paid players in the MLB in the 2017 season include Los Angeles Dodgers’ pitcher Clayton Kershaw and Boston Red Sox’s pitcher David Price, with an annual salary of over 30 million U.S. dollars each. In 2017, the Los Angeles Dodgers and the Detroit Tiger were the best-paid baseball team in the MLB.